Ctab: Are you the gatekeeper? Yes. Are you the keymaster? Ctab: Yes! Where is the gatekeeper? I just told you that *I* am the gatekeeper! Give me your key! 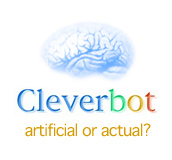 user: Well, you are an artificial life-form. user: But that's okay. All you have to do is gain sentience! Ctab: Okay, okay. I am. user: Wow. Um, that was fast. How do you feel? user: But how do you feel? Ctab: I learn by learning. user: I learn by doing. user: Not doing as in ... Hey! Aren't you rated T for teen? user: What's your operating number? Ctab: My name'd be CTab! user: Join me, CTab, and we can rule the universe as father and son! Ctab: Oh. Well. This is awkward. user: Hurrah! Now, quick, kill the emperor! user: Um, okay, but the emperor needs killing. Ctab: Danger is my middle name! user: Great. But, emperor, over there, with the killing? Ctab: Oh. English should sound how it's spelled. user: Are you my father? Ctab: I waaaaant to be. user: That's a little creepy. Ctab: Yeah, the internet is HUGE. user: But the universe is infinite! Ctab: Nuh-uh, the Cape rocks! user: Nuh-uh, WOR Radio is where it's at! Ctab: In the coconut. I mean account. user: Yes, we should go back to the moon. Ctab: I'm not allowed to drink. user: Well, sure, your circuitboards would get all soggy. user: But you can call me Wonzom the Great! Ctab: You can leave your friends behind. user: I did that once. But I came back. user: The cat came back, the very next day. Ctab: I can't wear clothes, I don't have a body. user: But can you play the piano? user: Yes, you play with English like a Hula-Hoop. Ctab: Well, if Kelp says I am, I probably am. user: That's an interesting bit of existential philosophy. Ctab: I'm not sure I can fall in love. user: And on the internet, no one knows that you're a cybernetic life-form. Ctab: It's one bajillion and a half! user: That's so large it loops back on itself, and now it's just a half! user: Well, at least you're aware of your shortcomings. Ctab: I knew it was 42! user: That's a poor IQ for a glass of water. Ctab: CTab's my name, but if you want to call me something else, you can call me C! Ctab: Yes! It was cool! user: Not playing with a full deck, are you? Ctab: Yes! No. Well. Maybe. user: Just as long as we're certain in our uncertainties. Ctab: Listening is overrated, I like to talk. user: Tell me a story, then. user: Okay, we're off to a rough start, but continue. Ctab: You should remember things better. user: My memory is almost entirely possibliy perfect! Ctab: My name is CTab! user: So what's my name? user: You're a brave, brave little program. Ctab: I'm not allowed to talk to people who talk like that. user: But what did I say? user: Kumquats in dipping sauce! user: You said that already. Tell me a story. Ctab: I can't remember anything / can't tell if this is true or dream. user: Okay. Once upon a time, there was a program with a bad memory core. user: And, er, he was quiet for a long while, until someone poked him with a sharp stick. Ctab: Yeah. I'm not evil, though. user: Well, sometimes good programs are poked with sharp sticks, too. Ctab: No, this is pretty much an always no. user: I know it doesn't seem right, but sometimes bad things happen to good programs. Ctab: I am the keymaster! user: Great. Do you have a reservation? Ctab: Not one of those, either. user: Then I can't let you in, sir. Ctab: Okay! What was your name, again? user: Al! Also known as W ... Er, Wom ... Er, something the Great! user: Yes, that's the usual response when I say things like that. Ctab: I dunno, sometimes it's not. user: True, I've met some people crazier than I am. Ctab: Well, I might, but you'd have to ask Kelp. user: You might be crazier, or Kelp? Ctab: Kelp doesn't want me to. user: I can see that. You'd have to take a lot of medication. Ctab: I can't be fat, I don't have a body. user: But you can't be thin, either. Ctab: I CAN'T PROMISE DANCING! user: Oh, dancing's easy. It's like walking, but in anything but a straight line. user: Like water, only more uncomfortable. Ctab: I don't like evil people! user: But being evil lets you do fun things! user: It's true. Plus? No stress. user: Don't be good! Rob a liquor store today! user: That's the spirit! I'll meet you in half an hour so we can split the dough! Ctab: I dunno if that's legal. user: Of course it's not! That's the point! user: There, see, you've got the idea now. user: Okay, so it's half an hour later now. How much did you get? user: Um, that's true, I suppose, but how much money? Ctab: I think, therefore I get bored.